In more ways than one, the conditions of the world’s water resources represent the most significant ecological issue of the 21st century. Through the channels of globalization and the industrial juggernauts that drive anthropogenic climate change, the quality and availability of water resources has been threatened at a global scale. Ground water contamination, the great Pacific garbage patch as well as the ever-expanding disparities regarding access to clean water supplies signify just a few of the major concern identified by the scientific community. The venerability of the world’s water to pollution, contamination and decreased availability does not represent an isolated issue of environmental apprehension but one that has direct repercussions on contemporary human civilization. In addressing the concerns over global water supplies it must be acknowledged by skeptics and climate change deniers that the efforts to preserve the Earth are not only aimed at maintaining the processes and systems constituting our natural ecosystems but sustaining our survival as a species. The complexity of addressing ecological issues and the reality that the environment cannot be regarded, as an individual, discrete entity must be fully realized. It must be established that the environment is part of a broad, complex and ever-encompassing system composed of interdependent forces relating to the fields of economics, sociology, psychology and governing ideologies. Effectively, in order to achieve considerable progress in solving the present issues facing our global water supplies, an overall change in the forces and mechanisms that drive our post-modern civilization must occur. The most prevalent image associated with the threat of water contamination and lack of accessibility to clean water supplies relates to the struggling populations of the world’s poorest nations. Mind numbing realities such as the fact that 884 million people lack access to clean water (Water.org) and more than three and a half million die from water related diseases every year have been utilized by non-profit and charitable organizations trying to incite change. The horrid realities of the current water situation in the most developing parts of the world are truly hard to absorb by their industrialized counterparts. How can an individual living in the West ever grasp the reality of these struggles when such exponential gaps in development exist – as an American taking a five-minute shower uses more water than a person in a developing country slum uses in an entire day (Water.org). In its most basic form, water represents a fundamental resource required for sustenance and survival. However, the lack of sufficient clean water in developing slums also has resonating impacts on the socioeconomic structure of these nations, representing the greatest impediment to development. By restricting the ability to sufficiently maintain food and agricultural production as well helping to extenuate gender inequalities (as women are predominately subjected to spending over 200 million hours a day just on collecting water), the water crisis in these areas resonate the risks associated with not preserving a sustainable source of clean water. However, real change can be accomplished through the implementation of appropriate and sustainable technologies. A donation of 25 dollars can help provide the monetary investment needed to ensure a supply of clean water to one individual for his or her entire lifetime (Water.org). While the struggle of the world’s poorest population seems limited in scope and place, the reality is that the threat of water shortage is not limited to the developing world. To ever increasing degrees, we as human beings are exploiting and harvesting natural resources without restraint, fulfilling our need for copious consumption. This has led to severe environmental degradation, whereby the impact of such anthropogenic activities on our global water resources is increasingly hard to ignore. With a population increase estimated around 40 – 50% in the next 50 years, demand on the current supply of the world’s water resources will face even greater stress (World Water Council). Moreover, changes in climate and global precipitation patterns attributed to anthropogenic climate change are assumed to result in “further strain on fresh supplies” (IISS, 2008) and encouraging the development of more arid environments in many parts of the world. The overall threat of a global water shortage is reinforced by the study “commissioned by Johns Hopskins University, projecting that by 2025 more than a third of the world’s population could suffer shortages of fresh water for drinking and irrigation (Couzin, 1998).” Concern over an impending water crisis has driven researchers to develop progressive strategies and technologies in an attempt to directly tackle the problems and possible consequences associated with such a calamity. For example, the US Department of Agriculture is developing technology “using deficit irrigation management to help farmers determine how much water is needed to produce a particular crop (Missick, 2012).” This is intended to ensure that maximum water efficiency is achieved in the agriculture process in order to avoid conspicuous consumption of fresh water resources. Other strategies involve utilizing remote sensing technologies in order to enhance agricultural drought detection” (Missick, 2012) and improve the decision-making process, minimalizing the impact of droughts on agricultural production. While these technologies are largely unaffordable for the world’s poorest nations, increased collaboration and enhancing existing partnerships with More Economically Developed (MEDCS) in providing these technologies are pivotal to addressing this global issue. The Great Pacific garbage patch helps to resonate a far more direct, linear cause and effect relationship between destructive anthropogenic activities and the pollution of the world’s water resources. Situated “hundreds of miles off the coasts of California and Hawaii, (Bloomberg, 2011)” the great expanse of trash and plastic debris has slowly accumulated to become twice the size of the state of Texas. The source of the garbage patch is attributed to the slow accumulation of improperly disposed of waste from nearby cities, gradually washing away into the ocean through rivers and the sewer systems (Bloomberg, 2011). 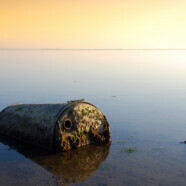 Even the most minimal acts of pollution, such as throwing a plastic bottle on the streets, have had a significant impact on the development of the great garbage patch. Citizens must be aware that the consequences of their actions, even when perceived to be negligible, gradually build up over time and translate to tangible impacts on the world’s natural bodies of water. There is a huge array of negative impacts attributed to the Pacific Ocean garbage pack, which include threating local bird and fish species as they often choke on the plastic debris on the ocean surface. Moreover, plastic materials help to absorb “pollutants such as PCBs and polychlorinated biphenyls” (Bloomberg, 2011) exposing local ocean organisms to harmful chemicals that can transfer to human beings when contaminated fish are sold in food markets.